It’s reasonable to assume from past events and history that privacy and security (or trust) concerns are always viewed differently depending on your original point in time. For example, my grandparents generation would never trust the banks, leaving the majority of their money in pots or hidden spaces around the house because this was deemed safer than allowing the banks to look after it. Moving to my parents generation they may well have put their money in the bank as this was now the more common and trusted way of keeping your money, but ask them to go online and undertake banking or financial transactions and this was deemed a security risk or they had trust issues. Again moving to my own generation with online banking, mobile phone apps and electronic communication and financial controls being the norm we in general (last few years aside maybe) trust the banks and financial institutions enough to not overly concern ourselves with the privacy and security of these new platforms…. However introduce something new, like wearable technology and hey presto we all doubt and question its intended use, security and privacy. Will our children? Unlikely, as they they will begin their journey through life with this becoming the norm and only when the next new thing is introduced will they question it! Now this is not to say we should not question and satisfy ourselves that the technology is used in the appropriate way and in accordance with the law, however it should also be noted that is this technology that different to what is available right now? It’s sleeker and will potentially appeal to a wider audience, but most people now have a smartphone; all of these have cameras and video cameras and I don’t remember being asked to leave this at the entrance to a bar or other public building/location. They all record voice and video and can take still pictures, just like Google Glass, how come none of the concern is about these devices, because they are the norm and we accept them, or because Google Glass does something else? 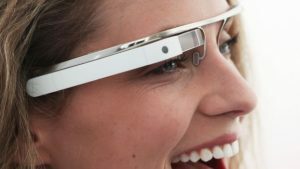 My smartphone will take images and video and with no intervention by me, upload to Dropbox or Google Drive or OneDrive, etc so why the panic and concern for Google Glass? I am sure in time, these devices will become the norm, we will just accept them as part of everyday life and there will be something else to concern ourselves over. Until then, let the questioning, panic, security worries and paranoia continue…. “OK glass, take a picture”! If you or your business are concerned about data security, website or data transfer security and would like to review or discuss these with one of our technical team, please get in touch with us here at Magikos IT by clicking the button below or by following the link to our ‘Contact’ page.